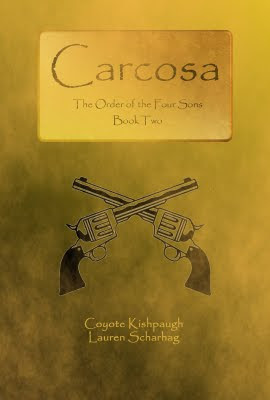 I am pleased to announce that after two years, Coyote and I have finally released Carcosa, the second book of The Order of the Four Sons series on Amazon. It is now available to download directly to your Kindle, iPod or iPhone. NOTE: You don’t actually need a Kindle or any other kind of e-reader device to actually be able to download e-books from Amazon. Let me say that again, because I actually get asked this a lot: YOU DON’T ACTUALLY NEED A KINDLE OR ANY OTHER KIND OF READER DEVICE TO BE ABLE TO DOWNLOAD E-BOOKS FROM AMAZON. They have made their Kindle reader application available for free here, so you can download books to your computer to read—as long as you don’t mind reading on a screen, that is. Which I don’t because, well, I’ve gotten used to staring at screens all day. Plus, it saves trees. So, go Kindle! If you do happen to download and read any or all of my books, do be sure to leave a review—I’d love to hear what you all think of them, good or bad. Also, please note that, like all things, you can like the books on Facebook or share them on Twitter. I’m just so pleased to be able to share some good news with you. Coyote and I wrote Book I in a year, 2007-2008. All things considered, we made good time on Book II—deaths in the family, illness, financial setbacks, changing jobs, surgeries, moves, car problems, floods, etc. There was more than one occasion that we sat in a hospital waiting room with the laptop banging away at the keyboard into the wee hours. I can’t speak for Coyote, but this series has been the one thing keeping me as sane as I am. So I hope if you get a chance, you will read and enjoy them for the same reason that I write them—pure escapist fun. Book II is dedicated to Stephen King. Aside from some obvious elements from The Gunslinger, a not-so-obvious influence is King’s plan to have not a series of separate books, but one continuous novel broken up into parts. So another thing that made Book II a little more slow-going is that we’ve had to write it and Book III more or less concurrently. We joke that our books are going to turn out like the Harry Potter series—Book I was small, Book II was not so small . . . and then somewhere around Goblet of Fire, you had a doorstop. We are currently 500 pages into Book III, which I think is going to our best yet. So what is the Order of the Four Sons? For those of you who don’t know what the hell I’m talking about, O4S is what I think would best be classified as “urban fantasy,” which is to say that the characters start out in this world, like Buffy or True Blood. But it’s our world with a twist—magic exists. Immortality is possible. Our heroes are a part of a secret and ancient organization that fights evil (the Order of the Four Sons, natch) and they get sucked through a series of interdimensional gates and have to find a way to get back home again. Kate West – a novice mage who has been with the Order for only a year. She was discovered by Bill Welsh as part of an investigation in a charity hospital with no memory of who she was or how she got there, but with tremendous magical abilities. The Order has taken her in and is helping her nurture her talents. Colonel JD Garnett – a seasoned marine veteran, Garnett joined the Order after his family was gunned down, caught in the crossfire between Starry Wisdom and MJ-12 operatives. Ryan Murphy – a trained medic and police detective, Murphy became an associate of the Order because he needed their assistance with a mysterious kidnapping case back in the 90s; the resident skeptic. Bill Welsh – a highly specialized technician known as a “quarterback” who operates out of a van, running communications between the Order’s field teams and regional offices. David Morgan – also a technician, Morgan operates field communication equipment for the Order’s operatives. Dr. Douglas Grigori – an elderly Order scholar and archivist who becomes something of a father figure and mentor to Kate. Clayton Grabowski – the Regional Director of North America for the Order; Alyssa’s foster father. Alyssa Calderon – born into the Order, Alyssa was quickly recognized as an Oracle—a particularly powerful psychic. Usually, Oracles are incapable of functioning in society, so she was locked in the Dormitory on the Field of St. Matthew. Clayton took her in and adopted her. Countess Elizabeth Bathory - a 500-year old serial killer who has achieved a form of immortality through blood magic rituals. Katarina Benicka – Bathory’s handmaiden and lover. Nathan DePriest – A murderous, albino mutation of Carcosa. Jack – No one knows his true name. His aliases have included H.H. Holmes, Herman Mudgett, and Hugh Musgrave, but you probably know him best as Jack the Ripper. Aaron Vickers – Petty, vindictive senior agent of a small group of operatives, Vickers has a dash of psychic ability, as well as a taste for pinching rare magical artifacts. Emily Hayes – a former marine who was recruited into MJ-12. As MJ-12 leads her further away from the values she was raised and trained with, she finds herself having to make the choice of where she is ultimately going to stand. Akhenaten– the King in Yellow; an ancient being clothed in the flesh of what was once a man, Its goals are inhuman and unfathomable, but one thing is certain—It serves only Itself. Check out the tabs above for the synopses of Books I and II, as well as links to Amazon. You can also click on the books at the side of this page and they will also take you to the Amazon site to view and/or purchase copies. Also, the tabs on this blog have been updated—the Links and About section all have new information, and excerpts from all my work are available. Be sure to swing by and check them out. Thank you! P.S., The title of Carcosa comes from a Robert Chambers story, The King in Yellow. Chambers was heavily influenced by Ambrose Bierce, and, in turn, strongly influenced H.P. Lovecraft, one of the great masters of the horror genre. So now-- onwards to Book III, which takes place in a world called Corbenic. Its title: Where Flap the Tatters of the King.